A roasted chicken is one of the easiest meals to assemble and a delicious one to enjoy. Even the leftovers (if there are any) form tasty helpings for lunch the next day. The key to a good roasted chicken, one that is moist and succulent, is the herb-butter rub that naturally bastes as the bird roasts at a high temperature. We’ve assembled some key autumn flavors for this fall version of roasted chicken. Sage and rosemary lend their seasonal flavors, while the “rack of vegetables” features root vegetables fresh from the garden, turnip, squash, and onions. 1. 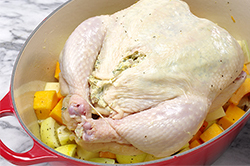 Preheat the oven to 425°F with the oven rack positioned in the lower third of the oven to leave enough headspace for the deep pan and the roasting chicken. 2. Prepare the chicken for roasting. Remove any giblets or neck bones from the cavities. 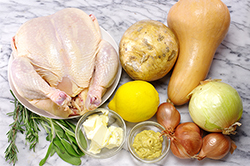 Place the chicken on a plate or platter and allow it to reach room temperature. 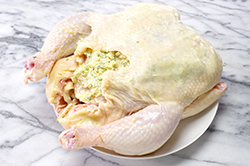 Using your fingers, separate the skin from the breast of the chicken to make a cavity for the herb butter. 3. 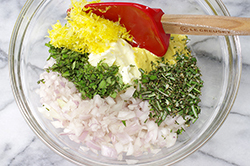 In a small bowl, mix the soft butter, shallots, sage, rosemary, Dijon mustard, and lemon zest. Place two-thirds of the herb butter mixture under the skin of the chicken. Rub the remaining third of the butter in the inside cavity of the bird. Loosely stuff the lemon wedges inside the bird; don’t overcrowd. Tuck the wings in and tie the legs together to keep them close to the body of the chicken during roasting. Sprinkle the chicken generously with 2 teaspoons of the coarse sea salt. Set aside. 4. 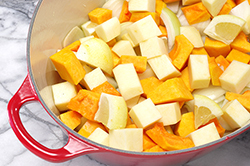 Meanwhile, prepare the vegetables: turnip, squash, and onion, (or fall root vegetables of your choice). In a large bowl, toss the vegetables with the olive oil until lightly coated. Sprinkle with one teaspoon of the salt and the black pepper. 5. Place the vegetables in the bottom of a lightly oiled oval French oven or large roasting pan. Place the chicken on top of the vegetables, breast-side up. 6. Roast the chicken and vegetables in the hot oven for 20 minutes. Remove from the oven, turn the chicken over, breast-side down, and roast for 20 more minutes. Turn the chicken, once again, breast-side up for an additional 20-30 minutes or until the internal temperature at the thickest point of the chicken (between the breast and thigh) reaches 180°F. 7. Transfer the roasted chicken to a carving board or platter and allow it to rest for 5 minutes before carving. 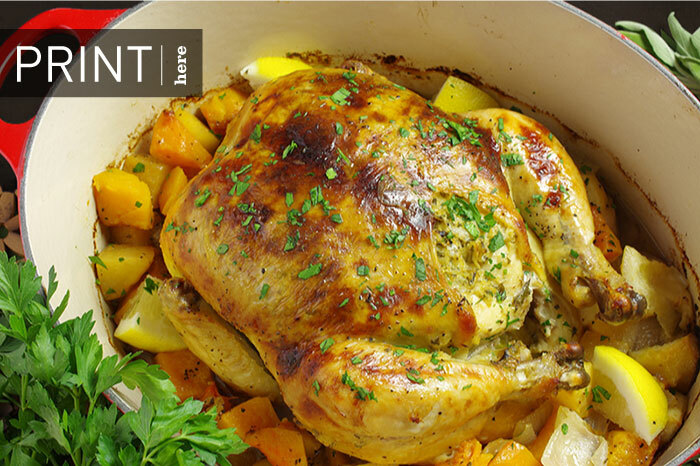 With a slotted spoon, remove the now roasted vegetables and arrange around the chicken. Serve and enjoy the roasted flavors of autumn.